The Sunport extends along the seaside of JR Takamatsu Station. The cityscape around it has been developing brilliantly for a dozen years. 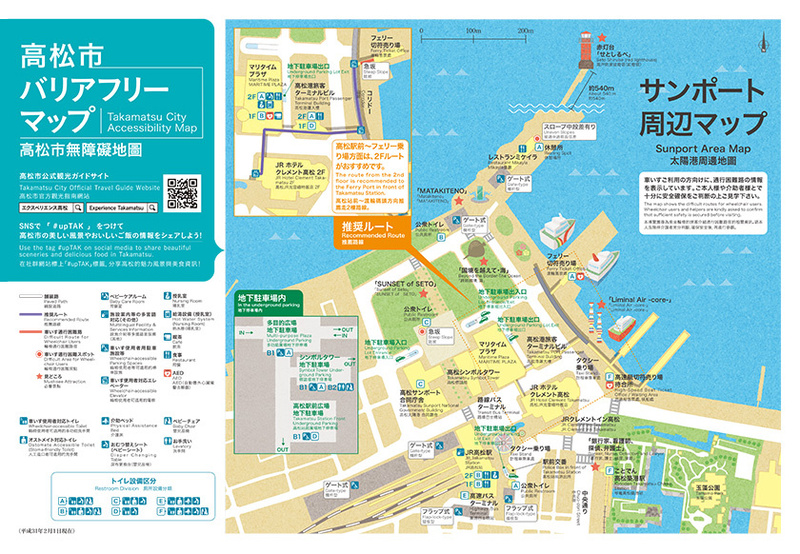 Now it is the center of Takamatsu not only for transport, but also for culture and information. New facilities, tourist attractions, restaurants and more have been erected. This feature focuses on Takamatsu for wheelchair users. Cars are the most common means of transport in Kagawa Prefecture. The Sunport is a compact cluster of various means of transport including railways, buses and ships. The Sunport Underground Parking Complex is useful for those visiting by car. It is highly recommended to wheelchair users who drive independently or who are driven by helpers when visiting the area surrounding the Sunport. This underground parking complex is divided into three zones: the Multi-Purpose Square Underground Parking Lot, the Symbol Tower Underground Parking Lot and the Takamatsu Station Square Underground Parking Lot. Each zone has two basement levels. Handicap parking can be found next to the management office on the upper basement level in each zone. You can park your car at the parking lot closest to your destination. If you slowly move forward from the entry gate, you will see a large sign board, which will help you navigate inside the facility. Each parking space has wide clear areas on both sides, making it easy to take a wheelchair out of or put one into a car. After getting out of the car, take the nearest elevator to your desired floor. Consider an example of a parking scenario at the Symbol Tower Underground Parking Lot to visit the Central Pier and then the Red Lighthouse. Located at the end of the Central Pier, the Red Lighthouse, also known as Setoshirube, is a landmark of Takamatsu Port. To reach the Red Lighthouse, take the long, flat pathway equipped with slopes. A relaxing excursion is nice on a sunny day among the sea breeze. Takamatsu Port has a number of nearby artworks. Continue slightly further to reach them. Take a look while visiting the Sunport. When strolling in the seaside area, you may become hungry. The Sunport has many different restaurants serving specialties of Kagawa Prefecture. The information below may be helpful when choosing where to eat in this district. Sanuki udon noodles are synonymous with Kagawa Prefecture. Enjoy udon noodles made of 100% domestic wheat and the master chef’s specialties. A Japanese restaurant serving kamameshi, rice and other fresh ingredients procured fresh from the market cooked in small pots, as well as sushi and fugu (blowfish) dishes. A grilled meat specialist runs a restaurant exclusively serving nikudon (rice bowls topped with meat), including juicy sanshu nikudon with three different pieces of tender meat cooked at a low heat. Suppose that you decided to enjoy lunch at MIKAILA in the Takamatsu Port Rest House. MIKAYLA is a casual restaurant at the Central Pier. Watch ferries arriving and departing and enjoy the view of the peaceful Takamatsu Port over a meal. The restaurant has such a large interior that it is easy to move in wheelchair. If you ask the staff, they will readily move your chair or offer other assistance. Order the fish dish of the day and sandwiches with grilled bacon and plenty of vegetables for lunch. Enjoy chatting in the warm atmosphere of the restaurant. The substantial meal and accommodations will make you very happy. Dining at an outdoor table is recommended on a day with a light breeze. Next to this restaurant is a parking lot with a barrier gate. Park there and directly enter the restaurant. It is so conveniently designed that it provides excellent space for entering and exiting a vehicle. This article was created with the help of Haruhito Tamura of the Mr. Kagawa Branch of the National Federation of Spinal Injury Sufferers Associations / Spinal Injuries Japan and Mr. Eiji Kawada. They say that they often visit the Sunport for business and personal matters in their daily lives. This area is relatively well developed, but it may have unexpected inconveniences. Mobility is more stress-free and sightseeing is more enjoyable for wheelchair users if those around them offer assistance. To make this area visited by many people in the future, we want to keep our perspective wide and eyes to notice (what is happening around us). IKUNAS can be inversely read as Sanuki. Each issue of the magazine is planned and edited based on a different topic chosen from the many attractive tangible and intangible things and people in Kagawa and other areas in Shikoku. IKUNAS continues to communicate information from a creative perspective.